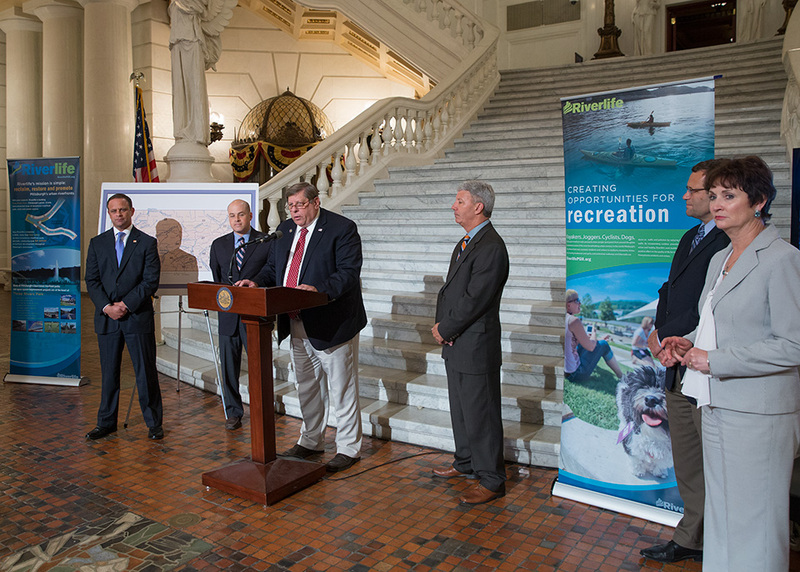 Senator Randy Vulakovich (R-Allegheny) and Representative Tom Killion (R-Delaware) hosted a press conference Tuesday (June 2) in the State Capitol to promote their legislation (Senate Bill 282 and House Bill 457) that would establish a Waterfront Development Tax Credit as a way to encourage private investment and spur economic development, environmental improvements and public recreational enhancements. amenities including infrastructure and recreational projects. “I believe that the Waterfront Development Tax Credit will provide the opportunity for Pennsylvania to set a nationwide standard of how to capitalize on the potential of waterfront sites to attract investment into the state to generate long-term value through public-private partnerships,” said Representative Killion. The legislators were joined at the press conference by Riverlife of Pittsburgh and other supporters of their efforts to enact legislation establishing a Waterfront Development Tax Credit. Since the inception of Riverlife in 1999, Pittsburgh has seen the investment of about $130 million directly in 10 riverfront projects and more than $4 billion of additional adjacent investment in the form of corporate headquarters and office buildings, hotels, sports and entertainment complexes and residences.